Whenever I hear about people who make crucial split second decisions, whether the result ends up being a heroic act or one of cowardice, I can't help but wonder what I would do if faced with the very same circumstances. It's easy to say I would do the right thing and decide to protect my loved ones rather than selfishly worry about my own safety, and deep down I do believe I would value their lives over my own, but how can I be sure? Unless actually faced with that scenario, as I am staring tragedy in the eyes and have to decide what to do without having a chance to think, how could I possibly know how I would react? Force Majeure, a film from Sweden which was a surprising omission from the Best Foreign Language Film category this year, uses this concept and then looks at the ramifications of such a decision. A photogenic and seemingly happy family are on vacation skiing the French Alps when at lunch one day they are admiring a controlled avalanche nearby, except it quickly feels far less controlled than it should be. As the snow rushes in their direction, panic begins to kick in and with practically no time to think a decision through, Tomas (Johannes Kuhnke), the father of the family, grabs his cell phone and runs away rather than make an attempt to protect his wife and children. As you can imagine, this doesn't go over well with them after the avalanche poses no real danger after all, and the remainder of the film analyzes the way a marriage crumbles after such a moment and also the concept of masculinity and gender roles as a whole in society. Force Majeure is labeled as a comedy by some but I found it to be far more dramatic with some humorous sequences to break up the tension, and my goodness is there tension. My favorite sequence in the film takes place after a friend of Tomas joins them on their trip with his much younger girlfriend and Ebba (Lisa Loven Kongsli), Tomas' wife, decides to bring up the topic of his abandoning his children in such a situation. Even though I was well aware that I was witnessing a fictional movie, it all felt so real and powerful and uncomfortable to the point that I was squirming in my seat hoping for some relief. 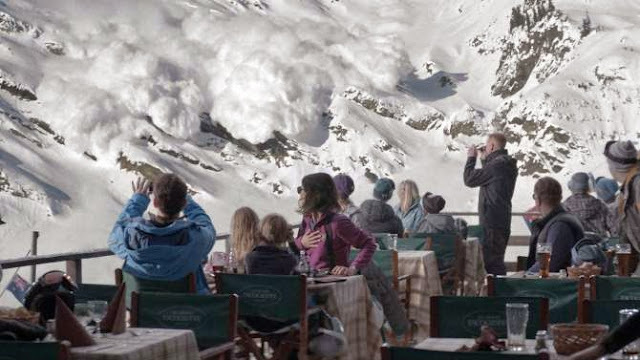 Force Majeure isn't a comfortable, fun cinematic experience, but it doesn't mean to be. Director Ruben Ostlund knows exactly what he is doing throughout, as every frame feels calculated and precise to ratchet up the tension and make the audience ponder what they would do, how they would react, and whether or not they could move on from such a ugly moment in their lives. The scene immediately after the one I highlighted above is of the friend, Mats (Kristofer Hivju) and his girlfriend as they are happy to leave that awkward scene behind, except now she is wondering: what would he do if the same thing happened to them? The fact that it is questioned causes a long, frustrating argument between the characters which feels so comical considering literally nothing occurred to actually cause it. I feel like these two characters represent any couples that watch Force Majeure together. As soon as it's over they will remark how uncomfortable the marriage was in it, but in the back of her mind the wife will always wonder...would he react the same way? haha absolutely Peter, well said. I watched it alone, so I didn't have to worry about my wife pondering how I would react.